“For the Lord has a day of vengeance, a year of recompense for the cause of Zion… And He shall stretch over it a line of tohu and stones of bohu” (Isaiah 34:8-11). Isaiah’s apocalyptic prophecy of destruction was interpreted by Nahmanides in terms of artistic creation: “… He shall stretch over it a line of tohu and stones of bohu, because the line is related to the thought of the building that the architect wishes to make…”1 The line of tohu (literally, a line of chaos) is thus interpreted as the measuring line used by the artist (architect) in order to give form to a creation which is doomed to destruction. Sheinman’s lines, … are lines of collapse and rupture: partly frames of collapsed buildings, partly broken veins and arteries, partly torn, disheveled dry branches. The artistic line has come a long way from the optimistic Jugendstil line of the 1900s – the bifurcating branch line, or the hair line flowing gracefully in waves, decorative and ideal – to Sheinman’s lines of the second millennium, lines of harm and injury that negate unity and continuity; lines of tohu. And above all, it is rhizomatic drawing, responding to the centralized blooming movement (or to a single stem or trunk) with a movement of spreading-extending-multiplying lines across a plateau. Gilles Deleuze and Felix Guattari coined the term “rhizome,” describing it thus in their book A Thousand Pleateaus: Capitalism and Schizophrenia (Paris, 1980): Evolutionary schemas would no longer follow models of arborecent descent going from the least to the most differentiated, but instead a rhizome operating immediately in the heterogeneous and jumping from one already differentiated line to another. The 9/11 series is more abstract than any of Daniella Sheinman’s work thus far. With it, she seems to come back full circle to her abstract starting point after her meeting with Kiva. The “thicket” is stormier than ever and the view of destruction, while avoiding drama, is also more forceful. The drawings’ title cannot but make us think of ripped building iron rods and torn steel skeleton frames. Despite the metaphysical-apocalyptic aspect of Daniella Sheinman’s 9/11 paintings/drawings, these are not works that paralyze our thought. On the contrary, they call upon us to reflect on the vanity of utopian towers (from the Tower of Babel, via the WTC towers, to the towers of Kuala Lumpur and Dubai) and on the lies of Utopia in general. As such, these works, like their predecessors (Venus, the Expulsion from Eden) are in accord with the postmodern tradition of opposing the notion of Utopia. Sheinman’s abstract language and artistic means guarantee mental detachment and emotional restraint, thus avoiding the effects of the “desire for the Real.” The traces of disaster drawn with infinite care on the big canvases are attentive to the quiet after the storm, taking care to remain on the boundary-line between the horrifying content and the autonomous shapes that ensure the “free play of the cognitive faculties” (Immanuel Kant, The Critique of Judgment, 1790). On this level, these drawings’ response to Absolute Evil is to suggest human freedom, artistic freedom. This is Daniella Sheinman’s third installation work, borrowing elements from the previous ones – Interior Space in Bayerische Vereinsbank in Frankfurt (1996), and Meanings of Life at the Ludwig Museum of Modern Art in Koblenz, Germany (1999). 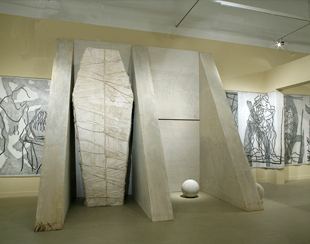 According to Pinchas Noy, “the beauty, greatness and aesthetic value of art stem from neither its contents nor its form or any other primary means of expression, but rather from the ability to combine them each time anew in new, original, creative ways.”3 Indeed, Sheinman’s three installations demonstrate the artist’s striking ability to use the same elements, combined with new ones, in different contexts, thus rending them fresh and original. What these three installations have in common is their materials. Sheinman does not attempt to astound or touch the viewer by means of cutting-edge technology or spectacular lighting. The installation is made entirely of simple, almost “humble” materials: canvas, graphite, wooden and plaster bars. It has none of the plethora of pyrotechnics to which we have become accustomed in installations of the last years, nor does it astound one at first glance; herein lies its power. Its simplicity is joined by a sort of well-planned workmanship – while, at the same time, the installation provokes a feeling of disorder by quite a few means, thus enhancing the effect of that remarkably systematic labor. The monochromatic palette – white, gray, black, and natural wood – intensifies the sense of restraint. The main elements of the installation – the mummy, the scrolls, and the pillars – are taken from the world of antiquity and are part of humankind’s collective memory. These visual elements, referring to the past, come together in the installation with contemporary events in which the boundary between collective and personal memory is also blurred. That blurring occurs when extreme events cause the outside to permeate what is inside or project the interior onto the exterior. According to Rachel Elior, “the public is an undefined corpus that establishes unity while endowing the individual with an identity consisting of memory and history, language and sacred texts, covenants and laws, precepts and sacraments, and defining geographical, cultural, historical, and national boundaries that contain an element which is unifying internally (Israel) and differentiating externally (Goyim).” In Sheinman’s installation, the public is not only Israel or the Jewish people, but the whole of humanity, eastern and western, of which the individual is part (Israel, too, is an individual part of the global whole). Events, even those that seem to take place far away, are in fact nearby, dictating the course of the here and now. The pillars represent stability and presence: “…in a pillar of cloud by day…and in a pillar of fire by night” (Exodus 13:21). Are the two pillars in the installation the central pillars that support a house? Perhaps they are like the twin pillars Yachin and Boaz, erected by King Solomon in the holy Temple he built in Jerusalem, which were endowed with a special status. Mordechai Omer explains: “The association between Yachin and Boaz, between left and right, is the same as the association prevailing in the cosmological system – an interaction between the right, which is ‘the dimension of the effective element,’ and the left, which is ‘the dimension of the receptive kingdom.’ Posting these two pillars side by side testifies to the need both for a measure of stability and of renewal in order to sustain the order of the world.” Are the pillars posted in the installation in order to convey a sense of balance? According to Sheinman, the pillars represent two beaten human figures attempting rapprochement. They are made of solid raw wood, their imposing presence conveying strength and stability. On the surrounding walls, painted, two-dimensional pillars appear like shadows of the three-dimensional ones. The drawn pillars are depicted in several variations, always (except once) appearing in pairs. We are familiar with many pillars in the history of humankind: from totems and obelisks to famous artworks by Auguste Rodin, Constantin Brâncuşi, or Joseph Beuys. The scroll is associated with the pillars on the one hand and with the mummy on the other. Unlike Sheinman’s former installations, where it was hung along the walls, here it becomes an object that stands right in the middle of the space, a cylinder of sorts, directed upwards like a pillar. “I see the act of turning the two-dimensional scroll into a three-dimensional one as an attempt to change things. My hope is that the spirit may carry things upwards, that hope may arise. Even if it seems impossible at present, let’s hope that in future things may turn out differently,” says the artist. 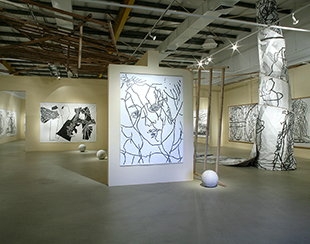 Like her drawings, the scroll is made in graphite on canvas – it is a drawing which is spread out over many meters, depicting shapes and shadows in lines and stains. At times, the graphite pencil is pressed hard enough to draw a sharp, black line, and at times it is used to draw different shades of gray. The length of the scrolldrawing evokes a sense of infinity, referring to the endless cycle of the universe with its ever-present basic elements.